Beach Lovers Guide to the Vale and beyond! I’ve lived in the Vale of Glamorgan, South Wales, for 14 years and I still feel like a tourist. Living by the coast gives you that holiday feeling all year round and I spend as much time at the beach as I can. As a family and child photographer I tend to combine my love of the beach with my love of photography and do a lot of shoots at my local beaches. If you’re like me and only truly happy with sandy feet and salty skin, then have a look at my beach lovers guide to the Vale and beyond! This is a very personal list, based on the places that I regularly visit or shoot at. I know there’s lots of other beautiful beaches in the area and still have plenty yet to visit. I live in a small village just outside Cowbridge, a busy market town, nestled amongst the gentle rolling hills West of Cardiff. So, I’ll start with my favourite local beaches and then head further afield to some of my favourites in the Gower and Pembrokeshire too. At a glance: Car park, Shop, Toilets, Lifeguards, Disabled facilities, no dogs between May-Sept. Although officially called Dunraven Bay, everyone locally calls it Southerndown, after the nearby village. This is my number one local beach. There’s something magical about driving down the steep road from the cliffs at the top to the car park below. You catch glimpses of the water and we’re always craning our necks on the way down the hill to see how much beach there is. It took a few years for us to understand the rhythm of the tides and to know what time to go to make sure there was sand to sit on (I’m originally a city dweller!). I’ve got the BBC Tide Tables as a favourite on my phone, so we never get caught out (anymore). There’s three car parks. One right by the beach and then an overflow car park on one of the fields above and a pay and display car park at the top of the hill. In recent years they have started charging for parking all year around (not just in the Summer months), so it can cost between £3.50-£5 to park for the day. There’s also a toilet block (very handy indeed) and a little kiosk shop selling ice creams and beach paraphernalia as well as a nice cup of tea. The beach itself is a lovely little bay, dwarfed by the Jurassic cliffs along the coast. Please be aware that there a regular rock falls from the cliffs, so you must not sit directly underneath them. When the tide is low, there’s a large crescent of sand to play on and some fabulous rock pools. When the tide is high, there’s no sand at all but you can still sit on the rocks (away from the cliffs) and enjoy time at the beach. If you walk through the car park and up the cliff, there’s lots of different paths to take to explore the area and also there’s the lovely Dunraven Gardens. Perched high on the cliff, they provide a great spot for a picnic and shelter from the wind as well. There’s lots of paths to take through the gardens and beyond to some awesome cliff top walks. I do a lot of family shoots at this beach all year round. If you’d like to see some, check out my blog and family portfolio. I’ve put a small handful in a little collage below. I could talk all day about Southerndown. It has a piece of my heart but there’s plenty more to see, so on we go. Frolics – An Italian restaurant right near the beach. Three Golden Cups – The nearest pub to the beach. At a glance: Car Park, Mobile vendors, Toilets, Lifeguards, Disabled facilities, dogs allowed all year. The Ogmore River meets the sea at Ogmore Beach. On one side there’s a large sandy beach and on the other side of the river are the Merthyr Mawr sand dunes (some of the largest dunes in Europe!). There’s a large car park at the beach and sometimes mobile coffee and ice cream vendors in the car park as well. Ogmore is a large beach and when the tide is out, you can walk quite far along beach towards Southerndown. 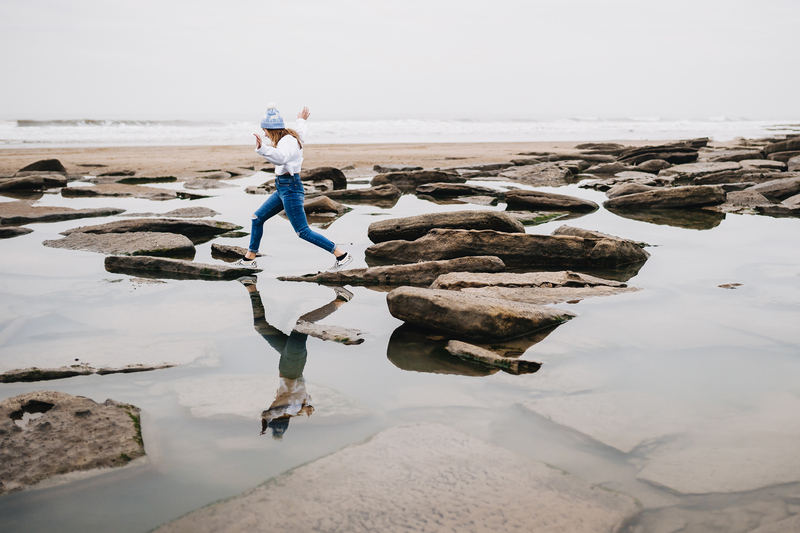 If the tide is in, then there’s plenty of rocks to climb and little coves to visit. There’s great rock pools too and a it’s a fabulous place to hunt for fossils. Cobbles Kitchen – Winner of the Welsh Restaurant of the Year 2018. This place is highly recommended and our ‘go to’ place for a coffee (and cake) on the way home from the beach. Also great for meals too. The Pelican in her Piety – A pub that also serves food. The Watermill – A Brains pub. It has an outdoor play area, so it’s great if you have little ones. 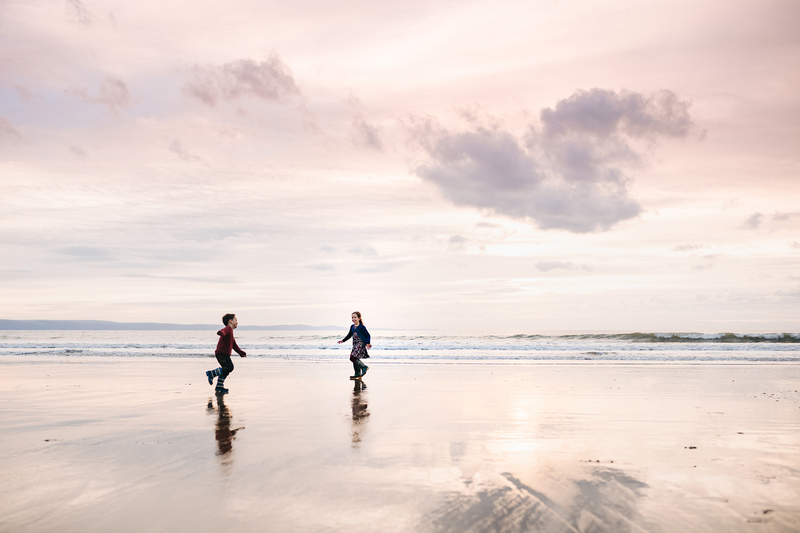 Just down the road from the seaside town of Porthcawl you’ll find Rest Bay. This is another one of my favourite places to hang out and where I go surfing with my daughter. It’s a massive beach and when the tide is low, there’s loads of room to spread out and spend the day (enjoying the odd game of rounders or cricket). The beach is very popular with surfers, kite surfers and body boarders and each has their own separate area to play (when the lifeguards are there). Most people tend to plonk their stuff down as soon as they hit the sand but if you walk a little way along the beach, it’s much quieter. There’s also a lovely boardwalk/path that runs along the back of the beach and beyond in the westerly direction. You can walk all the way from Porthcawl, past Rest Bay and along the coast on the same path. When my kids were younger it was a regular day out for us, with scooters, bikes or roller skates. We always tempted them with a picnic at Rest Bay and then a promise of a cake when they got back to Porthcawl! It’s also the route of the weekly 5k Parkrun on a Saturday morning. There’s a couple of surf schools and you can hire equipment from them as well as book lessons – so if you need a wetsuit or a surfboard in a hurry then they’ve got it covered. Visit Portcawl Surf and Adventures Wales for more information. There’s plans for a brand new sports centre and cafe to be built near the car park. Porthcawl is only a minute down the road and there’s plenty of cafes and shops there. Ah Rhossili. I first visited Rhossili on a camping trip with friends about 5 years ago. I’m ashamed to say, that even though I’m a massive beach lover, I was a little afraid of the water. Then one day in Rhossili, I threw caution to the wind and had my first experience of body boarding. The waves there can get pretty big but the bigger the better right? I’ve never looked back since that day. I went off and bought my own body board and then progressed to surfing a year or so later. Surfing is now my favourite thing to do. Ever. I’m rubbish at it but learning all the time and determined to improve. With a 3 mile stretch of sandy beach, ending with the iconic Worms Head and more beach awards than you can shake a stick at, Rhossili is one stunner of a beach. When we visit, it’s normally via the campsite Hillend, which is just behind the sand dunes in the centre of the beach. There’s a car park and also a cafe on the campsite with toilets etc. You can also access the beach from the National Trust car park at the Rhossili end of the beach. It’s a steep walk down from the car park but worth every step. If you love body boarding or surfing get down there. If you look closely you can see me surfing on the smallest wave in the world below. You can hire and buy surf gear from PJ’s Surf Shop in Llangennith. The King’s Head in Llangennith is great for a drink and dinner – a regular haunt of ours when we’re camping. 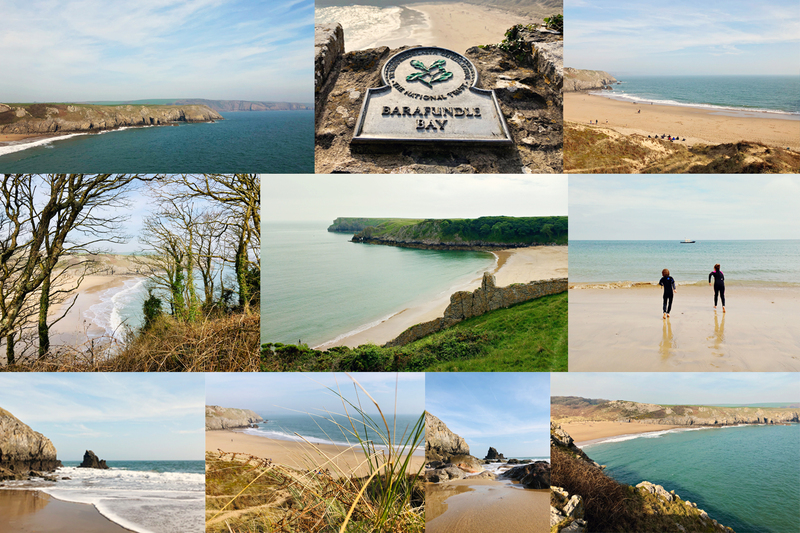 For years I wanted to visit Barafundle Bay but legend (Mum friends) had it that it was a massive walk from the car park to the beach and I was afraid of schlepping the kids on an epic walk so put off the visit until they were a bit older. We eventually made it there a few years ago and were pleasantly surprised (after packing supplies as if we were going to the North Pole), that it was in fact about a 10-15 minute walk from the National Trust car park. A pretty flat and easy walk too, apart from the stairs at the start and end. So, don’t be afraid my friends! Set the sat nav and off you go. There’s a car park, run by the National Trust and of course the obligatory National Trust cafe and toilet facilities. The last time we visited we went for a walk around the headland as well and could see over to the beautiful Broadhaven beach a bit further down the coast. 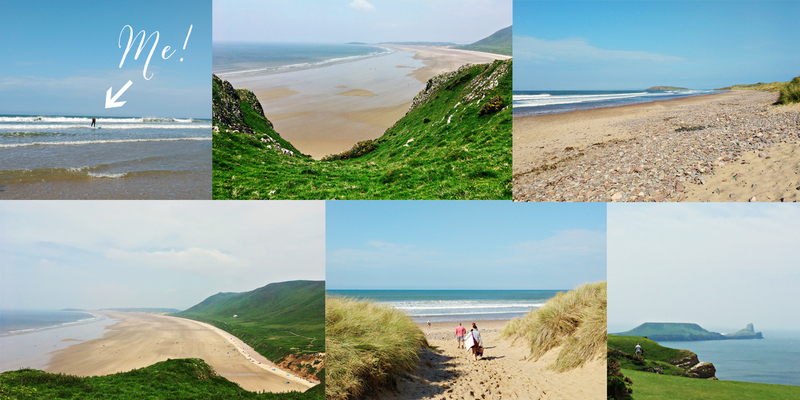 I know there’s a plethora of gorgeous beaches all the way along the Welsh coastline. It would be impossible to mention them all, so this is just a little taster of my favourites. 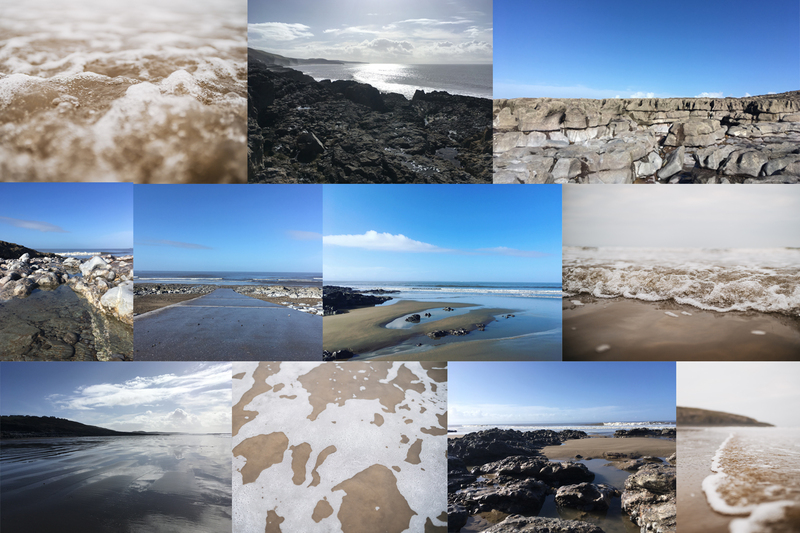 I can’t leave without a little shout out to some of the other gorgeous beaches that we’ve visited since moving to Wales 14 years ago. There’s many more that are on my ‘to see’ list. If you have any suggestions, let me know! Three Cliffs Bay – an absolute stunner. Bracelet Bay – a cute little bay with playground, car park and restaurant nearby. Langland Bay – family friendly beach with car park and facilities. Caswell Bay – popular with families and surfers. Car park and facilities nearby. Tenby – gorgeous beaches in this beautiful Pembrokeshire town. 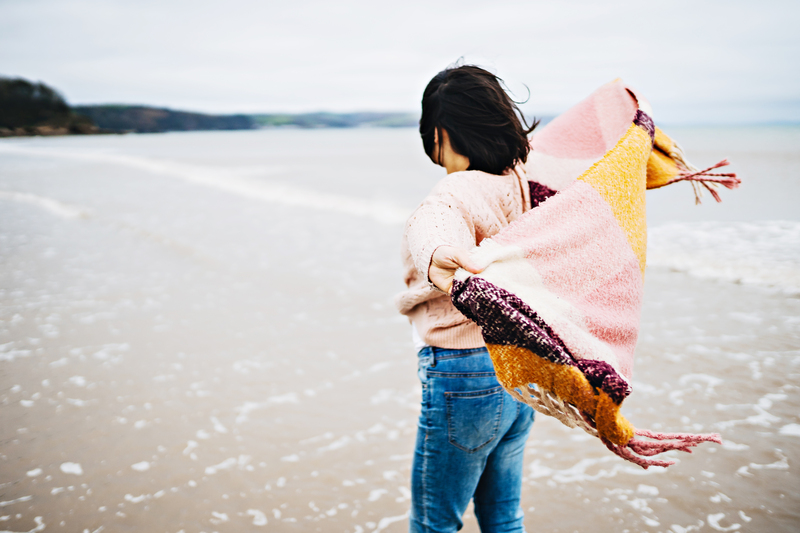 Saundersfoot – I can highly recommend the very decadent and perfectly placed St Brides Spa Hotel perched high on the hill overlooking the beach. Check out a fabulous headshot photo shoot in the hotel and a portrait shoot on the beach below. I’m always on the look out for new locations for family photo shoots and love discovering new beaches. If you have any recommendations, please let me know! 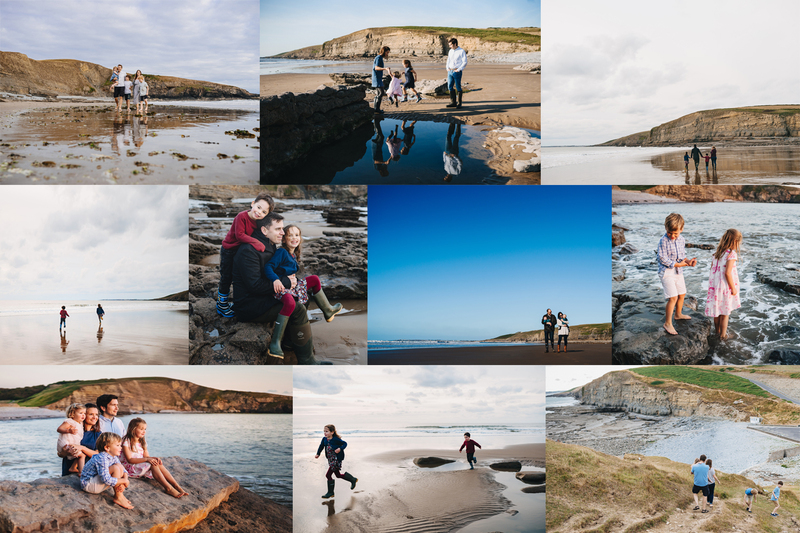 If you’d like to book a family photo shoot in South Wales, get in touch!